February Spring Bunny Fun Giveaway! Oh goodness! 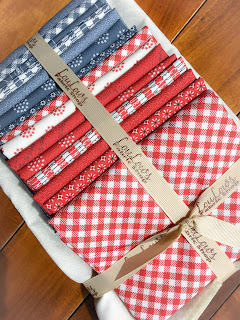 Two darling collections just landed in our shop over at loulousfabricshop.com! Rustic Elegance by Carta Bella for Riley Blake Designs is simply, rusticly stunning in it's entirety! The colors are beautifully soft and blend so perfectly. We are anxious to start creating with this lovliness! 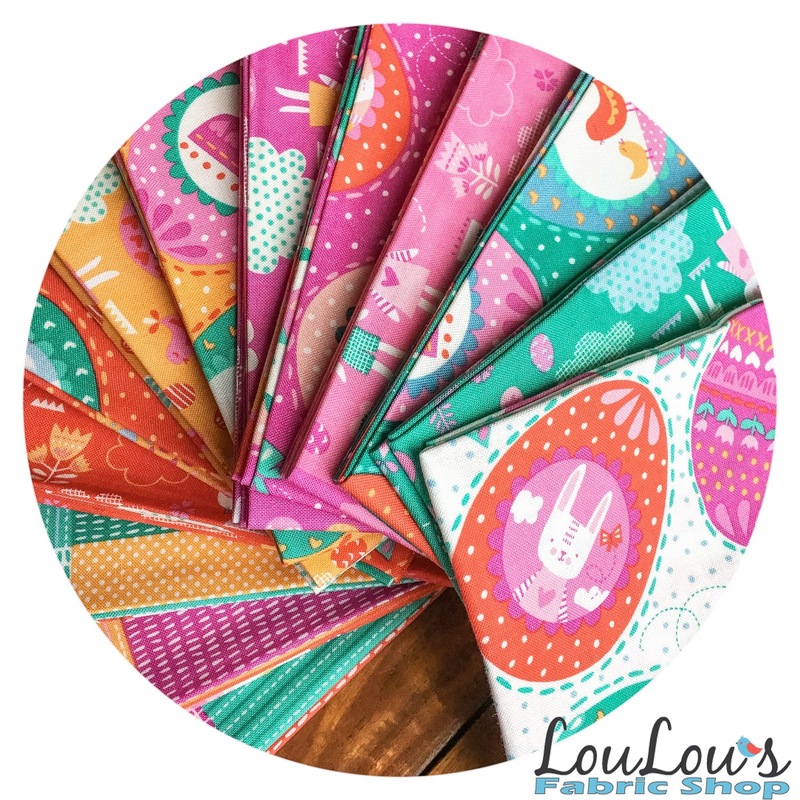 Spring Bunny Fun by Stacy Iest Hsu is bold, and vibrant and full of Spring just in time for your Easter projects! Can't you just picture a cute little Easter basket made out of Spring Bunny Fun? The most exciting aspect of this new collection is that it includes another one of Stacy's darling doll panels! 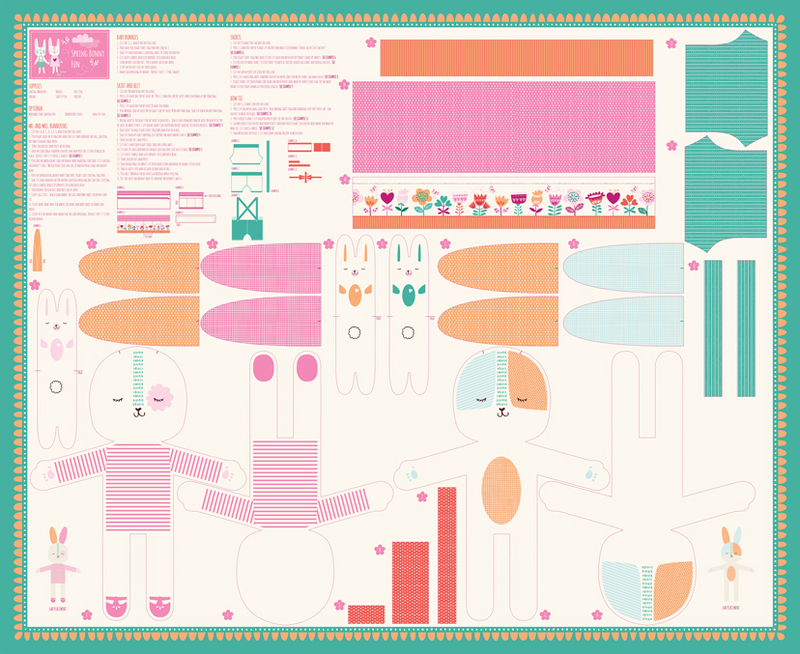 February Giveaway: This month we are giving away a fat quarter bundle of Spring Bunny Fun, including the doll panel! 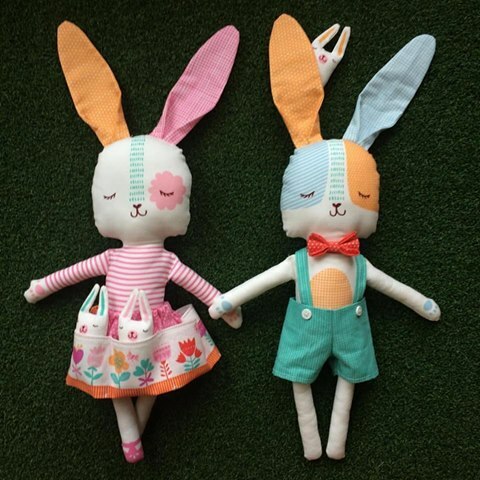 To enter our giveaway, leave us a comment and tell us who you'd be making this cute bunny family for. Also, find us on Facebook, Instagram and Twitter and enter there too! WINNER: Zoey Meeks! Thanks to all who entered our giveaway! 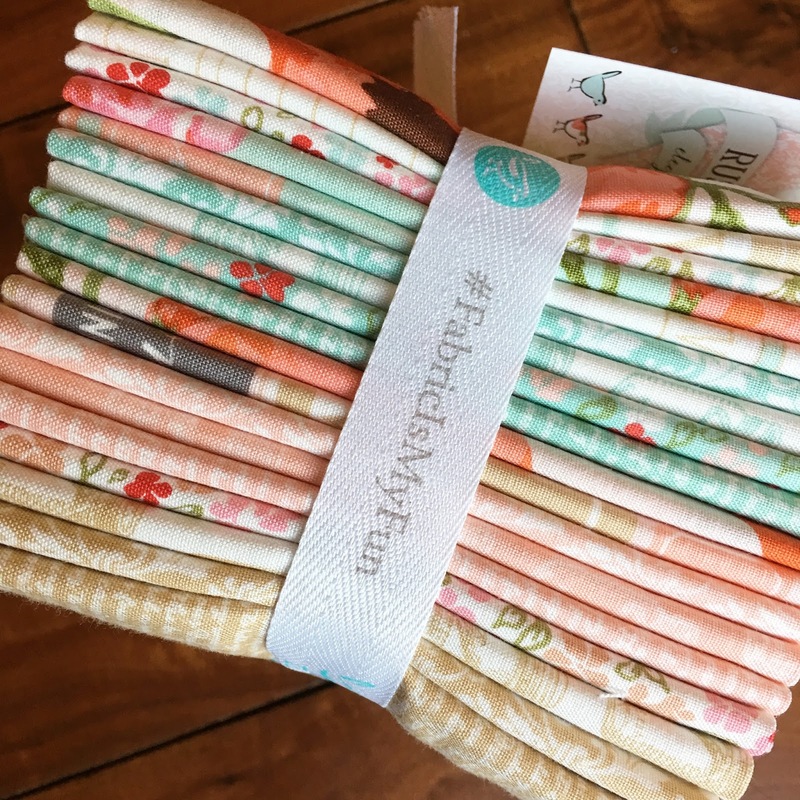 Check back next month for another opportunity to get your hands on some FREE fabric! 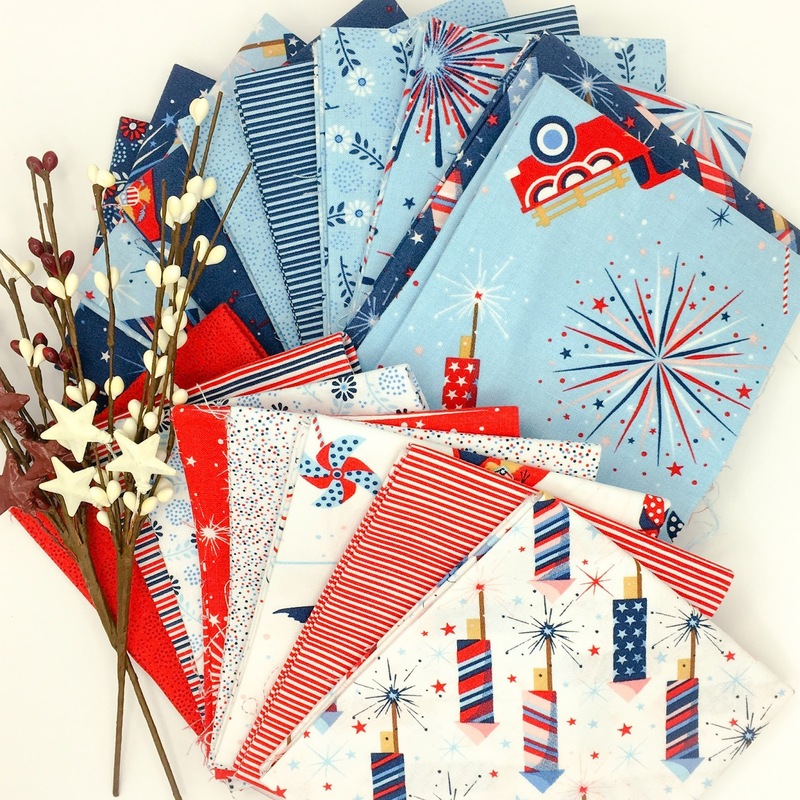 Do you ever have those days when sewing inspiration strikes out of nowhere? I wish I had them more often than I do and I wish even more so that I had the time to act on them when they come. Today was one of the far and few in between, magical days where the inspiration and the time landed at the same time. Well, I sorta, kinda had to rearrange (by rearrange, I mean neglect) a few things to figure out the time, but it all worked out and I love the finished product. 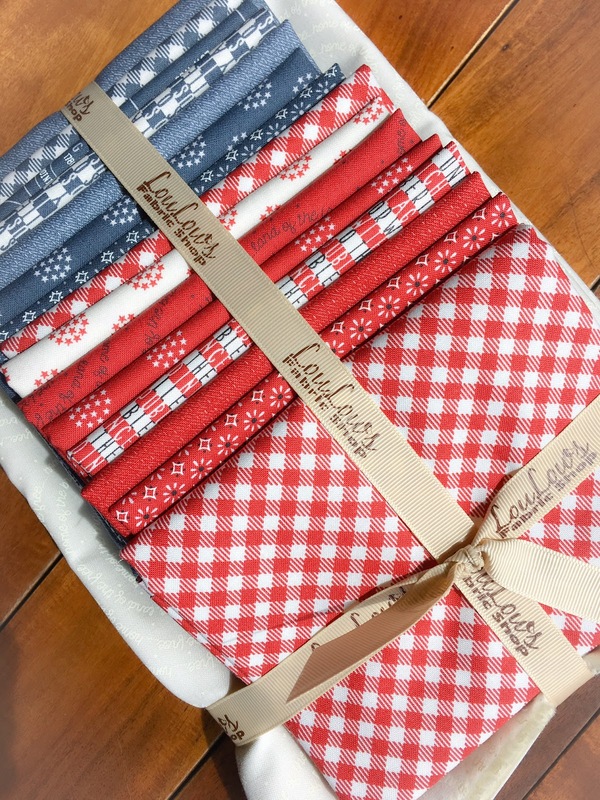 Get your kit at loulousfabricshop.com and make your own! Finished Size: 10 1/2" x 12 1/2"
Select and lay out 16 Mini Charm Squares (or 2.5" fabric squares) as pictured. Sew top row of 5 together. Sew bottom row of 5 together. Sew each side (3 squares) together as pictured. Cut a 6.5" square of vinyl. Cut (2) 6 1/2" x 2 1/2" strips of lining fabric - I used Black Moda Cross Weave. Layer one assembled 3-square side strip of fabric right side up, vinyl square and then one strip of lining fabric and sew 1/4 seam. Repeat the layering on the other side and again sew 1/4" seam. Turn right sides out on both sides, pressing carefully as to not melt the vinyl. (That would be a gosh awful mess that you really don't want). Cut (2) 10 1/2" x 2 1/2" lining strips. Layer the assembled 5-square top strip of fabric right side up, vinyl square and then one strip of lining fabric and sew 1/4 seam just as you did with the sides. Repeat with the bottom. Carefully press open. Stay stitch around the entire outside of your square. Place 12" zipper face down on top of pouch, secure with clips. Stitch length of zipper. Press open and top stitch close along seam. Cut (1) 4" x 12" strip of coordinating fabric, fold in half length wise and iron. Stitch to the opposite of the zipper as pictured. Press open and top stitch close to seam. Slide zipper to the middle of the square and stay stitch each end of the zipper as pictured. Trim off excess zipper as shown. Cut 11 1/2" x 13 1/2" square for stag background. I used Black Moda Cross Weave. Cut 6" square Wonder Under. 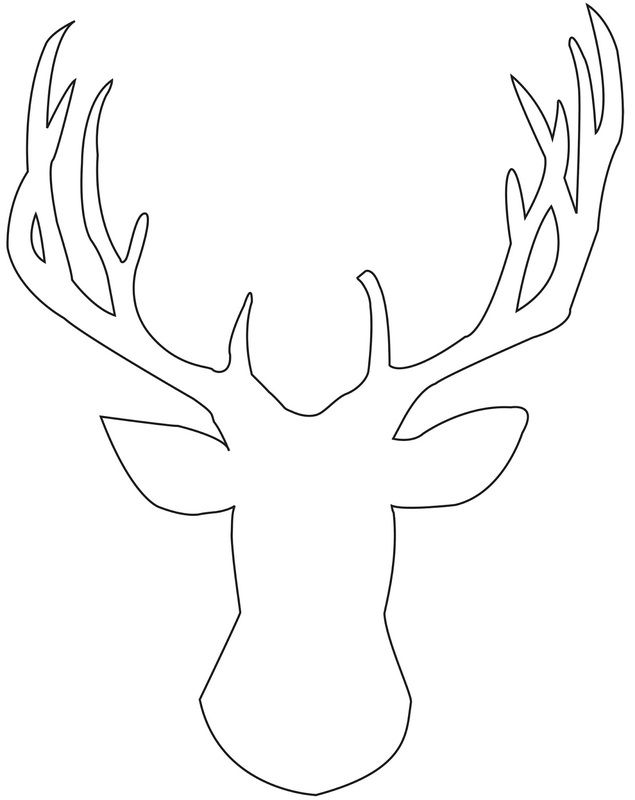 Print and cut out your stag pattern or draw your own. (I'm just not that talented.) I used the same stag pattern that I used for my Stag Pillow Duo Tutorial and resized it to fit within the 6" x 6" vinyl window. Tape your stag cutout to the paper side of the Wonder Under and trace around it. Because the pattern was so small, I simply used a highlighter and drew around the pattern which made it much quicker. Cut the stag out, peel off paper and position stag over the background fabric. I used the completed top of the pouch and positioned it over the background fabric and stag cutout to determine exact placement before I ironed it down. Iron stag to background fabric. Cut 12" x 14" piece of batting. Cut 12" x 14" pouch back fabric. Layer back fabric right side down, batting and then stag top right side up. Using spray adhesive, adhere the three layers together. Quilt as desired. I chose a simple straight stitch 1/4" apart, using Aurifil 50wt 2024. And of course, be sure to make time for machine problems. I was due, apparently. Okay, now you are ready to pin the pouch top to the back as pictured. Trim back to match all four sides of top. Baste around entire outer edge of pouch. Bind per your favorite method. I may or may not have gotten carried away with the wonder clips. I'll let you decide. Add your cute zipper pull. Sit and admire your work while you consume a bowl of homemade chicken noodle soup. There you have it! A cute Peeking Stag Zipper Pouch! We'd love to see your zipper pouch! 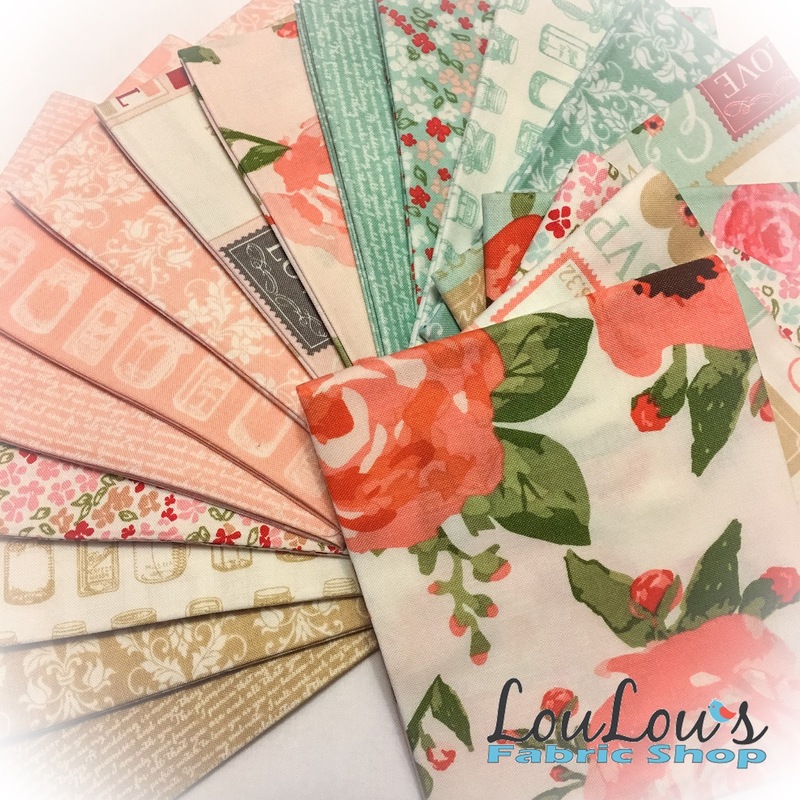 Please share on social media and tag LouLou's Fabric Shop and use hashtags #icansosewthis & #loulousfabricshop! This time of year, it's down right impossible to fit in absolutely everything that you want to do. If you're anything like me, the list of "have to dos" is ten times the list of "want to dos," and just when you think you're about to conquer the list of "have to dos," and can squeeze in a "want to do," the "have to dos" list seems to multiply ten fold. Oh, wait, that's not just this time of year. I think I'm kind of beginning to accept the fact that you just have to throw in a "want to do" from time to time regardless of how demanding the "have to dos" list is. Well, this Stag Pillow Tutorial was on my "want to do" list ever since the beautiful Juniper Berry collection arrived and I finally made it happen just in time to adorn my sofa with two fun holiday pillows for Christmas. So, set aside that "have to do" list for a few hours because this just went to the top of your "want to do" list and why not scratch it off?! Visit LouLou's Fabric Shop and grab your kit! Cut two rectangles 10 1/2" x 16 1/2"
Let the fun begin! Find or draw a stag pattern. I have no artistic abilities whatsoever so I perused the website and came across this free printable from Jenny Collier. 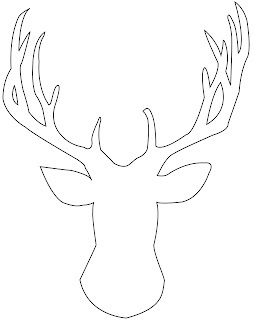 Print and cut out your stag design. Due to the size that I wanted, it printed on two pages, which I taped together. Following your tracing lines, cut out your stag. Position your stag over your square of Black Cross Weave as shown below and iron to adhere per Wonder Under instructions. Layer your pillow top backing, batting and stag pillow top as follows: (sorry, I failed to get a picture of the layering - but do it just like you would a quilt) What you're going to do is actually quilt the pillow top before attaching it to the pillow back. Secure all three layers with pins. I used my favorite 505 fabric adhesive and then added a few pins for good measure. Machine Quilt your pillow top to your liking. I chose to do straight lines 3/8" apart. I started in the center of the pillow top and then worked out to both sides. I used a classic white, Aurifil 50wt 2024 thread to make the pillow top really "pop." When your finished, it should look something like this. Trim off the excess batting and backing and square up your pillow top to 16 1/2". Now, you pillow top is all nice and clean and ready for the back! For your pillow back, you should have two pieces that are 10 1/2" x 16 1/2". Fold over and iron 1/2" down one long side of each piece. Straight stitch or zizag to create a hemmed edge on both pieces. Place your pillow top face down, then position your two back pieces, face up, with hemmed sides overlapping down the middle as pictured. All edges should align, with the two pieces overlapping in the middle. Secure in place with pins. Sew or baste 1/8" around the entire pillow square. Bind using your preferred method. Cut two strips 1 1/2" x 14"
Cut two strips 1 1/2" x 17"
Lay out your nine 5" squares in desired pattern, three rows of three. Sew the top row together and then repeat with the other two rows. Pressing seams in opposite directions so when you sew all three rows together, the seams will nest. Sew all three rows together and press seams. With right sides together sew one 1 1/2" x 14" border strip to each side of your 9 patch square. Press Seams. With right sides together sew one 1 1/2" x 17" strip to the top and bottom of your 9 patch square. Press seams. Secure all three layers with pins and/or use 505 fabric adhesive. Quilt to your liking. Once again, I used Aurifil 50wt 2024 and quilted as pictured. Prepare and sew the pillow back just as you did for the Stag Pillow. SHARE SHARE SHARE your pillows with us on Instagram and Facebook and tag LouLou's Fabric Shop! We'd love to see the holiday joy that's adorning your home! Oh, and cross off the Stag Pillow Duo from your "want to do" list!